Pour Chia Seed into a Large Bowl. Set Aside. Fill your blender with 1/2 of the ingredients. USE 2 C SOY MILK. Blend well until all of the cashews are dissolved. Pour 2/3 of the mix over the Chia, thoroughly saturating the seed. IF YOU PROCESS TOO LONG YOU WON'T HAVE ANY 'CRUNCH' or TEXTURE IN YOUR DESSERT - the blending will liquify them! BUT USE ONLY ONE C SOY MILK. 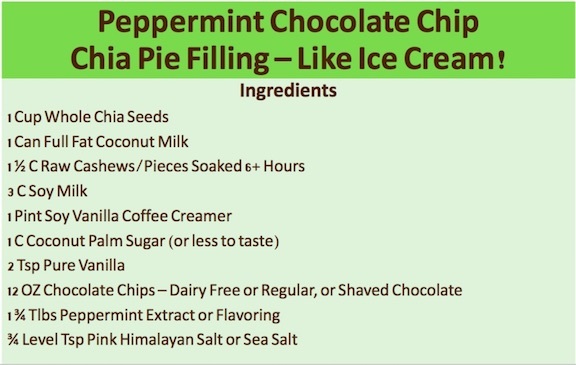 Use the remaining ingredients as listed. NOTE: IF you are making a smaller (1/2 Batch) amount, measure out 1/2 of the ingredients as for a larger batch, EXCEPT use: 2 C Soy Milk, 1 Tlbs Peppermint Flavor/Extract, the entire can of Coconut Milk and all of the Cashews.